Bu bölümde öğrenciler anlayamadıkları bölümleri daha iyi kavrayabilmek için kılavuz niteliğinde hazırlanmıştır. Konuyu daha iyi kavrayabilmek için buradan öğrendiklerinizle kendinizde çözmeye farklı örnekler yapmaya çalışınız. Öğrenci cevaplarını birebir kopyalamayınız. Buradaki 8. sınıf ingilizce tourism ders kitabı cevapları ve çözümleri sizin için derslerinize büyük katkı sağlayacak eksiklerinizi giderebileceksiniz. # 1. Match the attractions (1-6) to what you can see and do there (a-f). Then make sentences. # 2. Match the weather words with the photos. You may use more than one word for the photos. # 3. Work in pairs. Talk about your favourite weather and tourist attractions, as in the example. # 1. Which tourist attractions do you know in Turkey? Share in class. # 2. Which tourist attractions do you know in Turkey? Share in class. # 3. Match the people/visitors with the attractions they will enjoy most. # 4. Work in groups. Which place would you like to visit? Why? Share your ideas. # 1. Match the photos with the names below. # 2. Listen and write a number (1-8) to put these places in the order that the tour bus will visit them. # 3. Listen again and circle the best word to complete the sentences. 1) The tour takes 6 hours. 2) At Madame Tussauds, you can see models of famous people. 3) Oxford Street is a famous street for shopping. 4) The Queen lives at Buckingham Palace. 5) Big Ben is a clock. 6) You can see great views of London from London Eye. 7) You can see the Crown Jewels in the Tower of London. 8) Tower Bridge is over the River Thames. 9) ‘Changing of the Guards’ ceremony is at the Houses of Parliament. # 4. Work in pairs. 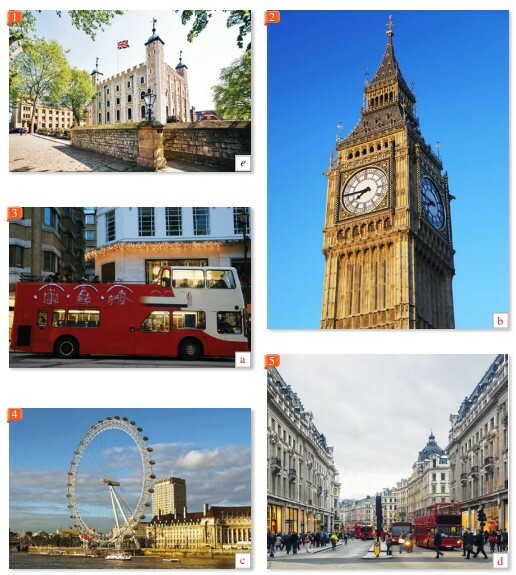 What are the tourist attractions of London? What can you do there? Talk with your partner. # 1. Complete the dialogue with the words in the boxes. # 2. Choose the correct word. # 3. Complete the dialogue with the correct sentence/phrase in the box. 1) How was your holiday? 3) Where did you go? 4) Where did you stay? 5) What was the weather like? 6) Did you take lots of photos? # 4. Fill in the blanks with the correct forms of the verbs: shop, book, have, watch, stay, visit, see, get.